Looking great Dave. Who did the seat re-cover for you with the metallic piping? Another shot showing the seat with the tank, it came new from Texvina in Vietnam, James, its extra with the silver strip, if anyone orders, the cheaper priced version doesn't have it. Looks a very decent copy Dave. Good job..
Well we've been at this for nearly a year now, the first photos of the bike as delivered are dated 16 November 2017. I never wanted to finish it too quickly, as a man needs a hobby, I'd only go and buy another project ( classic VW camper van anyone?). However it is 50 next year, so it would be nice to resurrect her for her Golden Jubilee, it could even show up at Crich 2019. 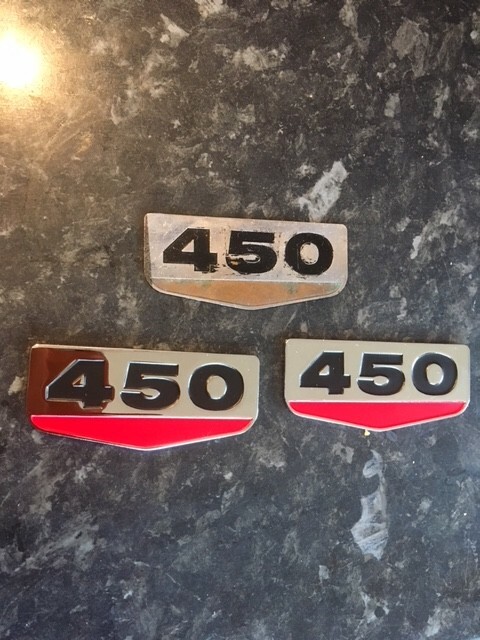 I had a go at restoring the side panel badges, and soon realised that the best result I was going to get was 'less scruffy' - although the faded painted sections are recessed and therefore easy to do, the plated sections were very tatty and finely scratched. In the end I decided that as the newly painted side panels were so nice, tatty badges were just going to let the bike down. At that point I picked up my iPad, and ordered the expensive new ones from BadgeReplicas Australia. That was Friday night, so I was quite surprised that they turned up with the postman today (Tuesday)! Postage wasn't cheap but obviously you get the service you pay for. It took me two days to get there myself. I also had constant emails updating me of progress. No taxes or duties, which was good. Cheaper badges are available on eBay, but beware, the ones sold in threes are stickers, not the same at all. 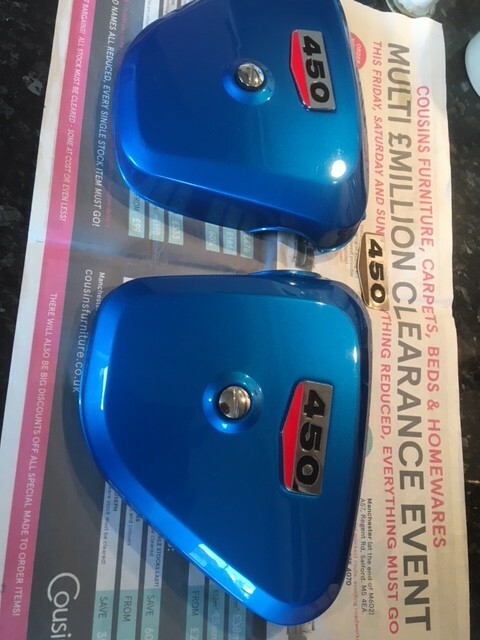 These are super quality, thicker than the originals but very nice chrome and paint. One of the originals is shown for comparison. After that it was only a matter of time before I stuck them on. The new centre grommet and screw are from an Italian CB450 kit I bought on eBay, strangely enough supplied from California. If my mate the human engine hoist (6ft 7) is available Saturday, I may lob the engine back in, which should really get me going again. No top yoke yet, but I'm not fussed as James has a pair of K1 ones, and Silvers actually list the K2 one as available NOS! As my chassis is a K2 number I reckon it must fit, but we will see. Or eBay will provide, it hasn't let me down yet, apart from the odd non fitting part. Meanwhile I put the original on, if you fasten one end of the guage bracket you can't see the other end is missing, which is how I bought it. When I finally do something about it and fit the yoke / damper etc, any recommendations for fork oil? The manual says use ATF, but I've also read that its about SAE 5W and rubbish at damping. Fork oil is a bit of a mystery realy, back then specific fork oil did not exist and atf tended to be specified as it did not "froth" like ordinary oil. Personally i would try 10w fork oil and see how it works, you can then go thinner or thicker and, compared to what has already been spent, does not cost the earth. Thanks Bryan, I've ordered a litre of 10W - there's 295cc in each leg so 500cc isn't enough. I'm pretty sure that I put ATF in the CB750, without problem, but if I go off road on the CL450 its going to get a hard time. I need to pm Nurse Julie and order an O-ring / filter kit for my petcock, as they will have gone rock hard. Dont forget to replace the washers under the holding screws or fuel will leak straight through. I have used 6mm dowty type with cap screws before now with sucess. They are basically the same I think. The reason for 5 viscosity is that it's easier to maintain that over a huge temperature range without intervention chemically. So automatic transmissions and hydraulic systems (dampers) have the same properties demanded. The systems are designed from the beginning to work with lower viscosity rather than being a compromise. Both also need anti-foam to prevent aeration, this is usually some type of silicon polymer as I understand it. To this point they could be considered the same. Fork oil then adds PTFE (also named as Teflon if they pay money to use the trade description) this is to reduce stiction, the effect of still moving the fork's sliding bearings while trying to bend them backwards under braking load. Most bikes are going to be ok on 5 or 10 but if you go too high it won't be the spring that resists compression of the fork but hydraulic locking. It'll make the front bob up and down by using the tire as a spring. Don't think ATF uses PTFE as it'll not help the clutches in the autobox. In other news I am hoping to get the back brake drum polished later tonight, so I can refit the back wheel and have a rolling chassis again, but my plans to get the engine back in on Saturday may be put on hold as the engine hoist is broken - the wife visited him today with a Birthday present for his girlfriend, to find him laid up with a bad back! Lugging around my CL450 engine probably isn't high on the things he'd like to do list at present, especially if wriggling it about to get the starter motor to clear the front frame tube at the same time as clearing the top rail is as much faff on the way back in as it was on the way out. I'm not doing it myself, as then we'd both have a dodgy back - older people and old bikes are a dodgy mix sometimes, I used to think nothing of pulling big Brit twin engines out on my own. Serious milestone on Saturday, as the engine went back in! Here is my glamorous assistant, his back was better, and I did help as much as I could. Considering the struggle we had getting the thing out, we were both a bit surprised as to how easily it went back in. I guess learning what snagged on the way out helped us avoid problems, also I didn't bother with loads of foam or material, we decided touching up any scratches would be easier. 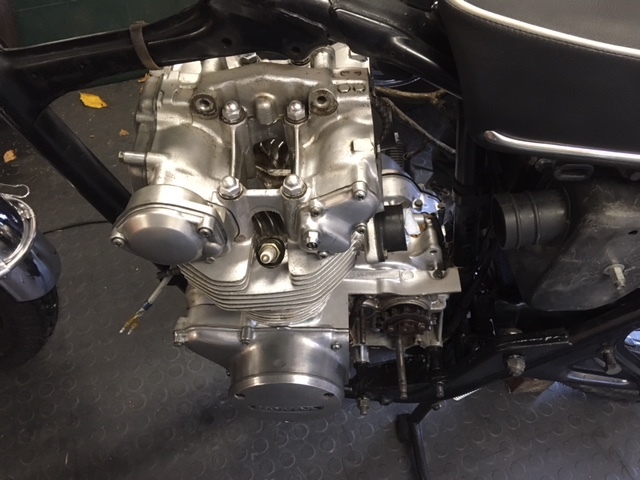 Putting on a load of parts now, just to see what it would look like one day when finished, just to take them off again to get on with the rebuild, would be silly, but... oh sod it! Knowing just how good looking it's going to be will keep me motivated over the long winter nights. As good looking as any other CL I've seen, almost exactly a year since I bid on the barn find. My mate, at 6'7" pointed out how small it all looks, I'm 'only' 6 foot, but sitting on it she feels small to me - it's a long time since I had a bike less than 500cc. The carbs have gone off to another mate for an ultrasonic bath - one was clean inside, the other full of fur. 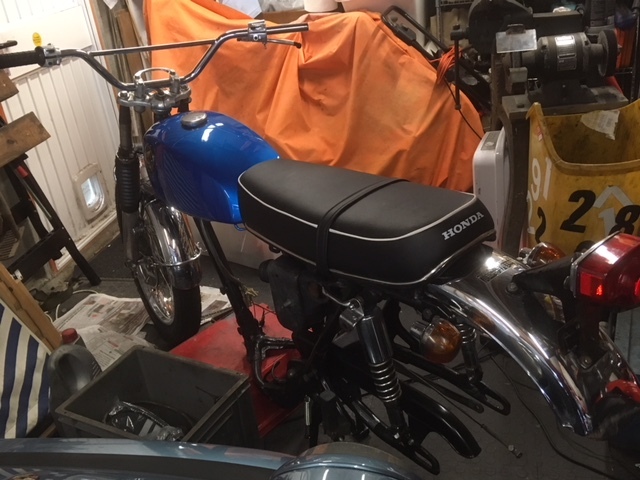 Not much happened this month, but I was rewarded for my patience when a 1969 CL450 top yoke popped up on the bay Stateside, its now on its way here but not expected until early January. It seems to be identical to the one on the bike, apart from the damaged bracket, here's hoping. 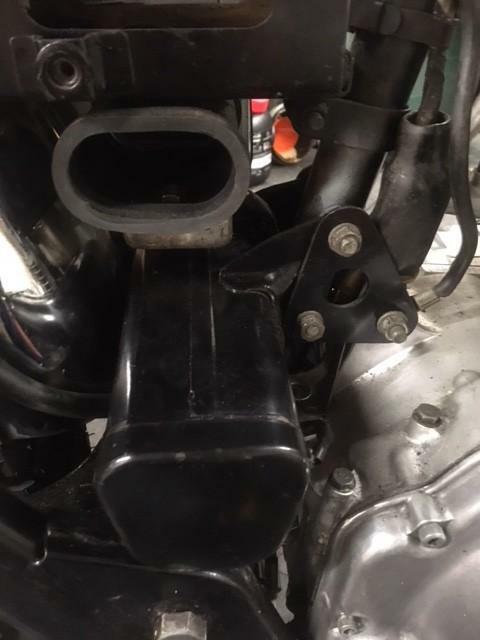 My accidentally bought CB450 K1 yoke is up on there now, but I won't break the rules and link to it. My mate Mark, who is a professional bike restorer and trader, and picked up the bike for me from Summerbud in his van a year ago, came round on a rare visit the other day, he said he can't believe it's the same bike! That is a wonderful colour.. and I just love the CL look, they are so classy with the high exhaust. Thanks Andy. More news from the front, I'm trying to make the most of having room to work in the garage for a change, as my 911 has gone off to Cheshire Sport Classics, who are trying to find a new home for it. They sold two 3.2s last month, even though its hardly the right time of year for it. Their website has a large portfolio of photos that they took, and on their Facebook page are pictures of an ex James Hunt F1 car that they are restoring for a client, though sadly not on site so I haven't seen it yet (I think its the McLaren M26 that sold for $1.2 million a couple of years ago, the car he had his last win in). I wonder if it has an ashtray? 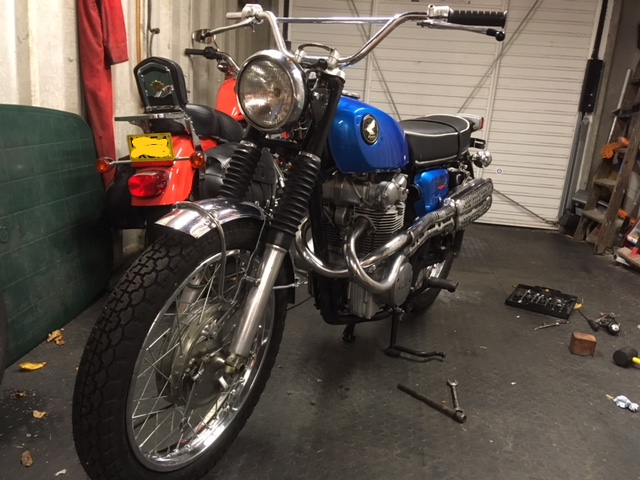 Although the bike looks more or less complete in the earlier pictures, that was just a rough build to see if everything fit Ok and what it would look like, the first thing I had to do was strip a lot of bits off again, but this time I'm doing it properly for keeps, so it all feels like positive progress now. First I finished putting the engine in, there wasn't a toolbox on the bike when I got it, so I've fitted one from eBay, that came complete with the toolkit. Unfortunately, looking in the manual I've fitted the earth lead to the wrong bolt, it should be the upper one between the toolbox and frame lug, so it will have to come off again. I had wondered about the conductivity of the engine enamel. There is an issue with the kickstart, it works fine but there is no positive stop to stop the lever going too far forward until it touches the engine or footrest, desite a new spring. I know its not right, but as the answer will be inside the cases I think, I'll leave it for now and see if its an issue when the bike is running. If a common problem it may explain why I've seen a couple of CLs with no kickstart fitted. Its not as though I need one, the Harley hasn't got one at all, although kickstarting a 1200 twin would probably give me a heart attack. Next I decided that working brakes would help. 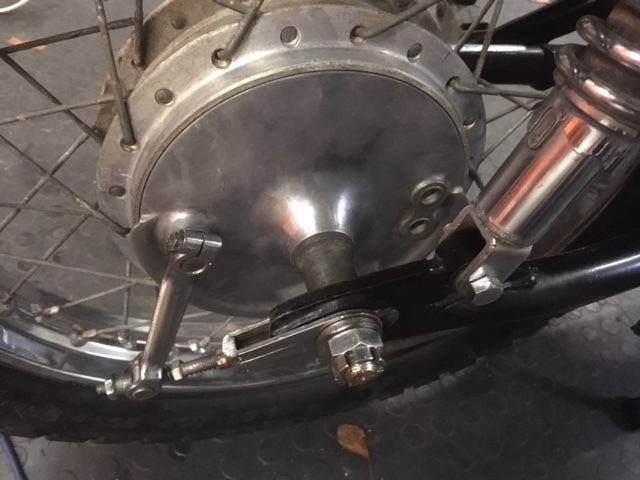 I took the back wheel off and refurbished the brake, as it was working but sticking on. Cleaning up the spindles and reassembling with copper grease did the trick at the same time I cleaned up and polished the brake plate while it was bare. I also ordered a chain, as once its fitted I can put the gearbox sprocket cover on properly and fit the clutch cable. It didn't want to adjust at all when I fitted the new cable, then I realised the lever and linkage were on inside out, sadly revealing some hidden rust, so I need to do a little more cleaning and painting. All will be good in the end though, now I have a working front brake. 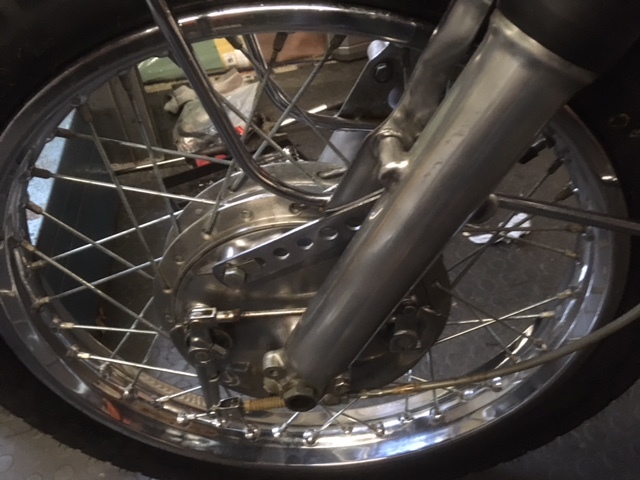 I haven't got the front wheel spindle in correctly, as the wheel has a little lateral play, looking just now at the parts book to see if I was missing a spacer, I see that the spindle goes in from the other side, and that hexagonal spacer is back to front, so I think that's my problem. Finally I put the coils and Ebay'd horn on (the original was missing), and stared to connect the wiring up. Good news is that the ignition switch works and the key fits the steering lock as well, I need to get a spare cut. For the sharp eyed, the missing head steady nut, by the way, is the one I had to cut off before I could get the engine out, I need to remember to order one when my 'parts still needed' list is ready to go. Look at 1:32 - wonder if that’s one of our CL450’s?